No! Don’t be ridiculous, I’m not going to make inroads into the basket of long-forgotten shirts and rashly chosen clothes made from inconvenient fabric that has the nerve to crease. 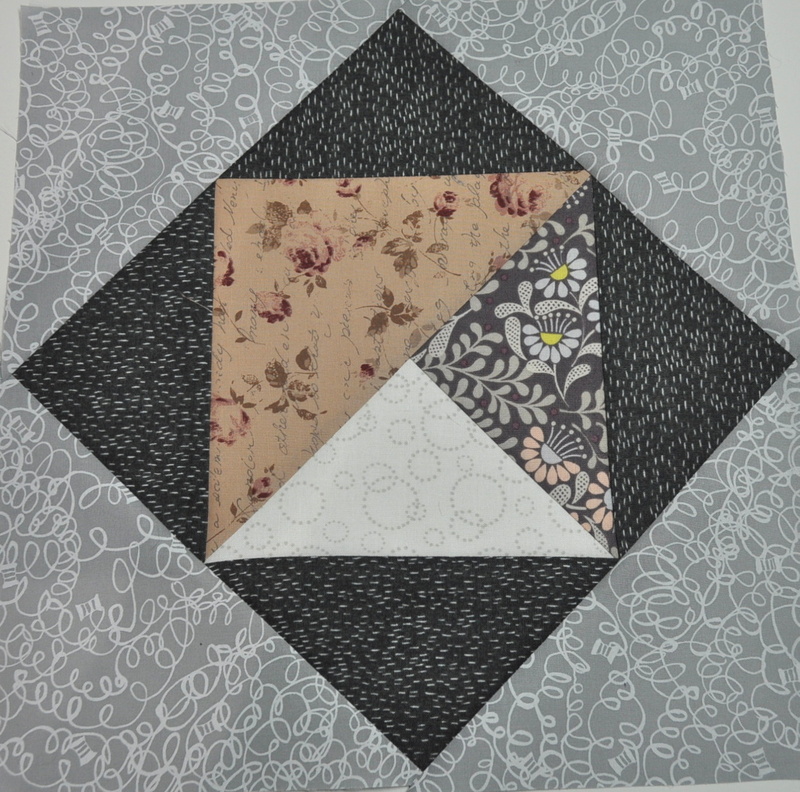 No – the Foot Square Freestyle Block Swap is back and I will be needing to press small pieces of delicious fabric on a regular basis. 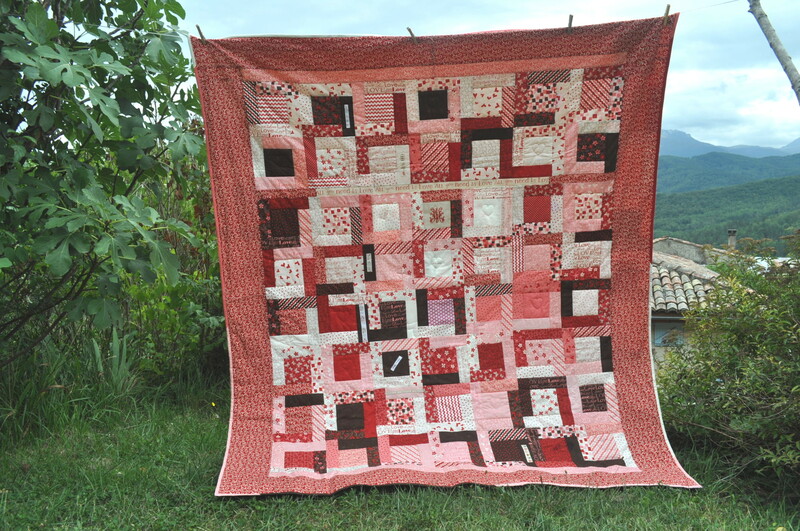 Kate, over at Tall Tales from Chiconia has, once again, taken on the organisation of the third F2F worldwide block swap, bless her. I can only think she must enjoy herding cats as, whenever I have been rash enough to take on the role of an organiser, that’s what it seems to be like. Which is why I’m a team player rather than a team leader. There are nine of us this year from all over the World and we will each make three blocks a month and send them to the person who has been drawn out of a hat to be the recipient that month. We can all choose what colours we want but the design is up to the person making the blocks so all skill levels are catered for. 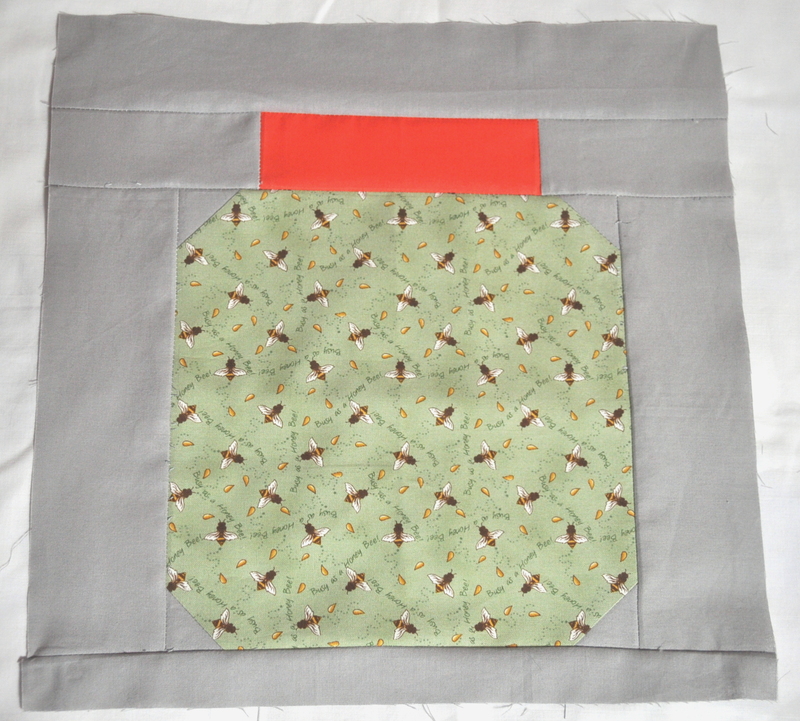 At the end of ‘our’ month, or shortly afterwards, we will have 27 blocks measuring 12 inches (finished size) – hence the ‘foot square’ of the title if you speak ‘imperial measurements’ – with which to make into a quilt. 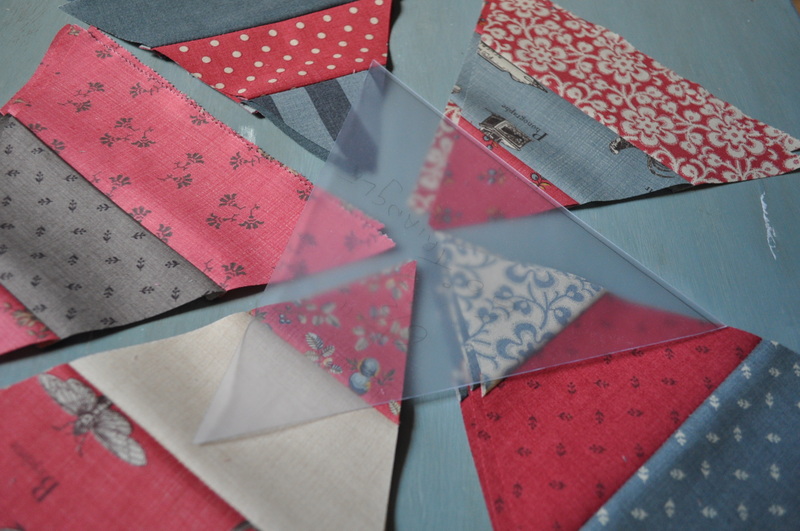 I have missed the swap as I couldn’t find anything else like it when Kate took a year off from doing it last year and it was a very good exercise for improving patchwork skills, trying out some new ones (foundation paper piecing anyone?) plus working with colours you might not normally use yourself. As last time, my name was drawn out of the hat first so I will be ‘Miss June’ (which is appropriate as it’s my birthday month) and will be receiving three blocks from all the other participants some time later in the month or early in July. Just wondering – why is it that my name never comes first out of the hat when there are big prizes to be won? 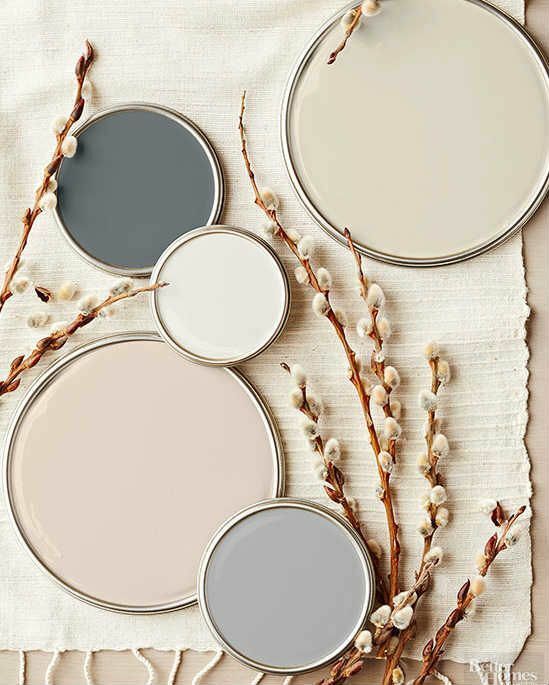 with vintage, faded rose pinks . 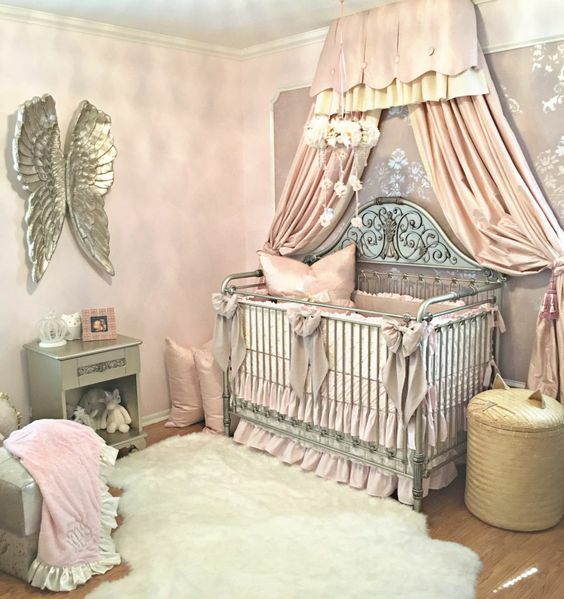 Why did my parents not provide me with such a bedroom when I was a child? Would I have appreciated it if they did? Probably not but I still feel slightly miffed. So, I have made my first block just to get my hand in as I am severely out of practice and need to improve before I start sending out work to those who may or may not be more capable than me (but probably are). A simple one to start but, even then, one of my points isn’t perfect. The further down the line the participant is the better off they’ll be as I probably won’t be fully up to speed again for a couple of months. Although, of course, I will be trying very hard. There’s nothing like sending off your work to others who do the same sort of work to inspire improvement. 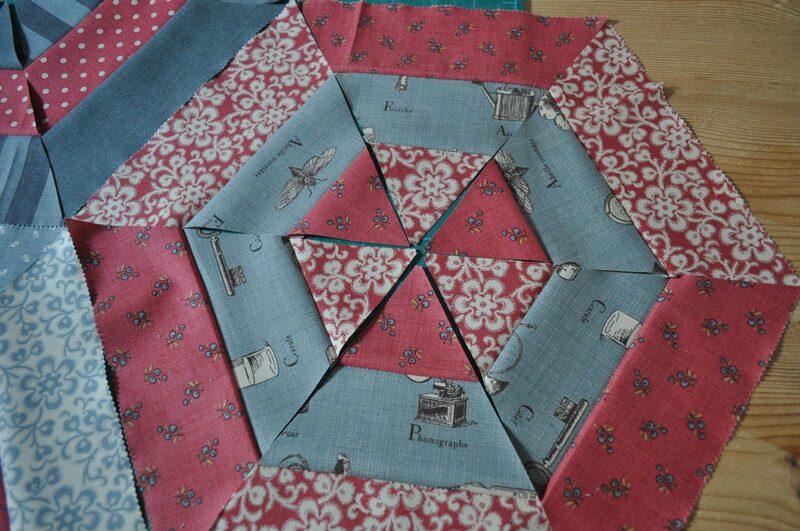 Most of my regular readers will know I have been involved in a patchwork block swap with a group of twelve blogging friends from the States, U.K., France. 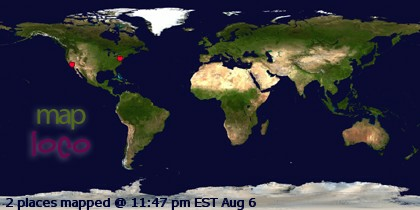 Germany, the Netherlands and Australia. We were each allocated a month – mine was in October – and we receive three blocks in our previously chosen colours from each of the other participants, making 36 with which to eventually make a lovely quilt. One of our number – Pat – had been diagnosed with ovarian cancer before the swap began but she felt it would give her something to aim for by participating and she was regularly contributing her blocks despite her health concerns. In the draw at the beginning of the swap, her name was picked for the last month of the twelve month period but, despite offers to swap with her for an earlier month, Pat felt it would give her a target so ‘Miss May’ she remained. However, sadly, Pat has now stopped her treatment and is receiving palliative care. 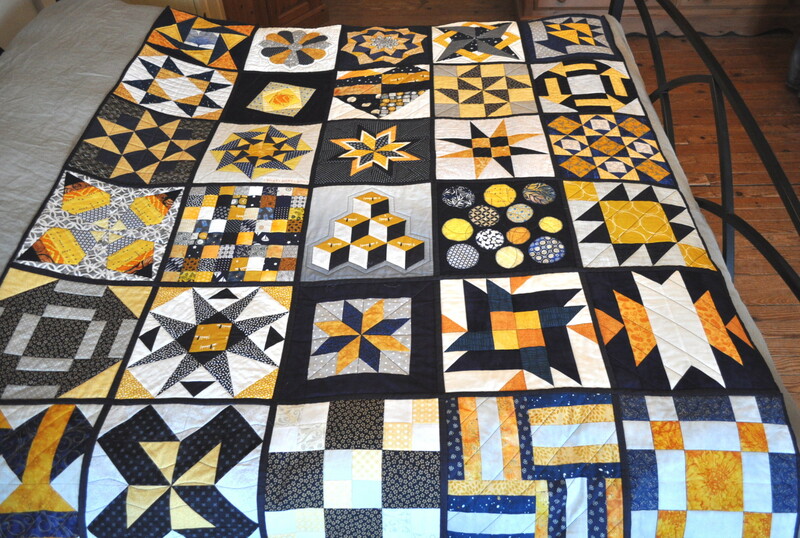 The race was on to get the blocks for Pat’s quilt underway and sent to the U.S. for Sue, one of the organizers of the F2F swap, to put them all together and get them quilted by her son on his longarm quilting machine. So, ‘Miss January’ was dropped like a hot brick (sorry Emmely!) 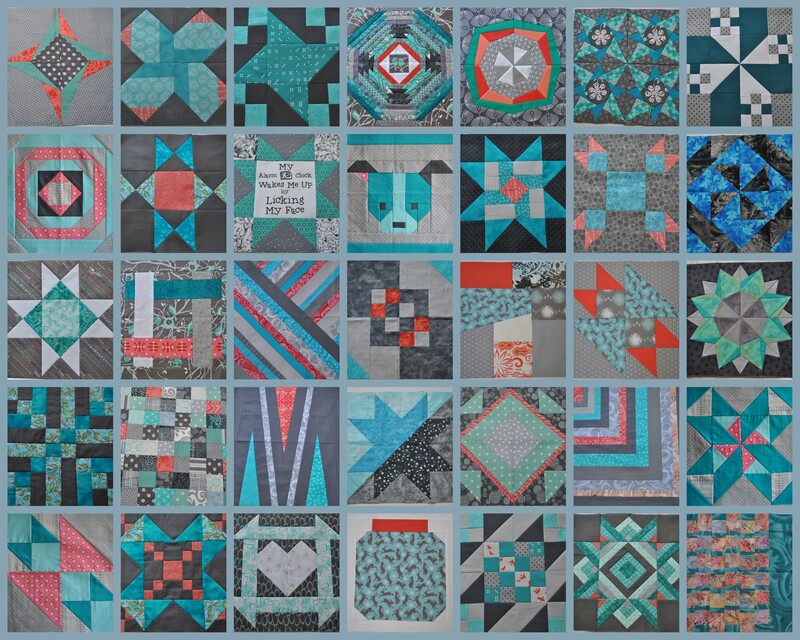 and we all started instead on Pat’s blocks which she had requested in teal blue with tan or cream – teal being the colour of the Ovarian Cancer ribbon symbol. I never realised I could piece a block so fast! As these blocks are being made in far flung places and all have to make their way by post to the U.S., the actual, final quilt may take a little longer to come together so we all took photographs of the blocks we made and they were transformed into a ‘virtual quilt’ so that Pat can get an idea of what her quilt will look like when it’s ready. 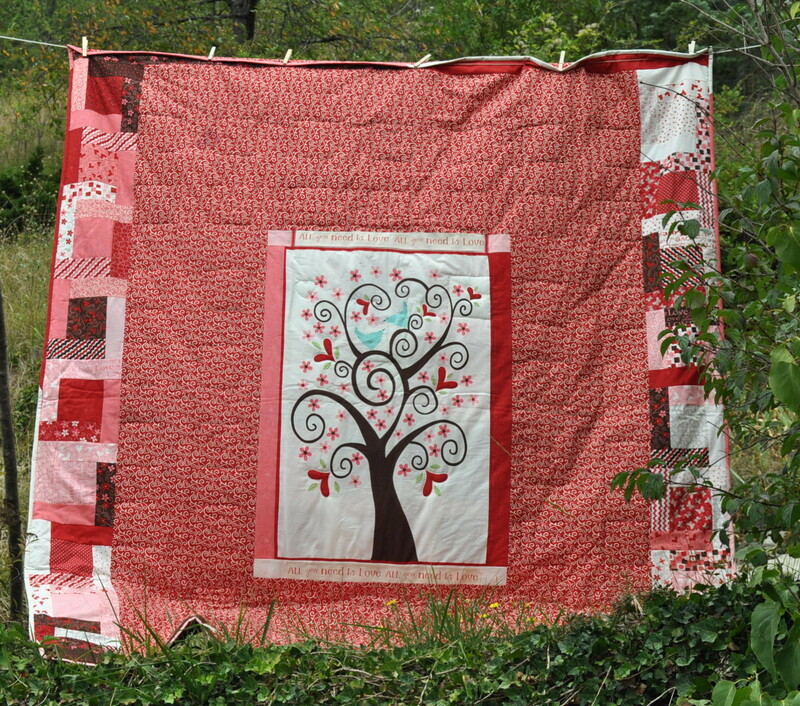 We all really hope that we will have been in time and Pat will be able to see and touch her real life quilt. I keep meaning to tell you about the blockfest I’m a part of which has been organised by Kate over at Tall Tales From Chiconia and Sue From The Magpies Nest and involves twelve people from all over the World. It’s called Foot²Freestyle because each block will have a finished size of 12 inches or a foot, get it?. Every month, one of the twelve participants is ‘the one’ and the other eleven participants make three blocks and send them to ‘the one’ so there will be eleven parcels to open, each holding three patchwork blocks in colours asked for at the beginning of the swap. I do love a parcel – it’s my turn in October. 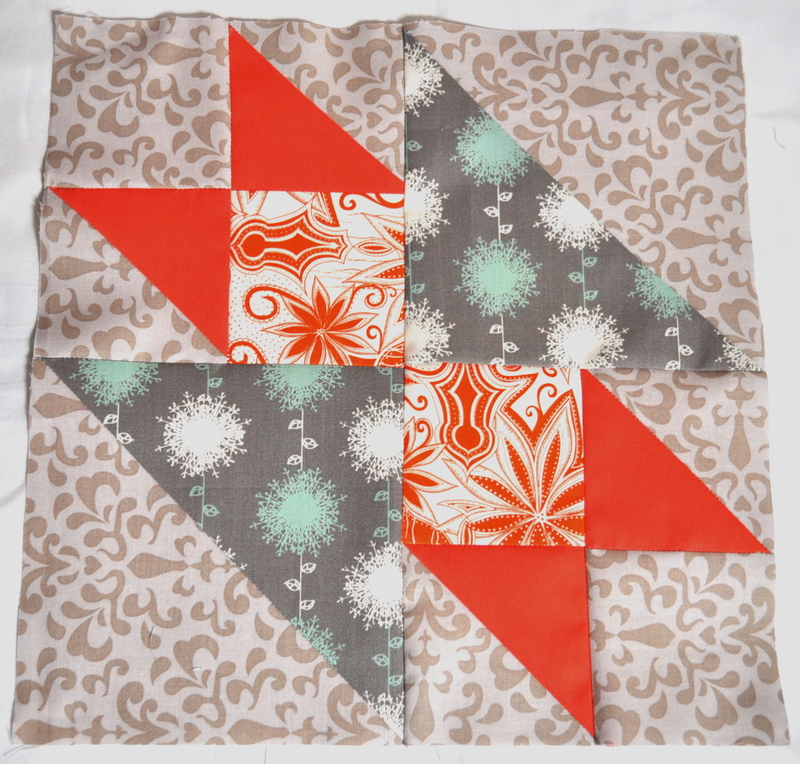 Then, the recipient will make three blocks of her own, making 36 big blocks with which to make a 72 inch square quilt or whatever else you would like to do with twelve patchwork blocks (no rude suggestions please). 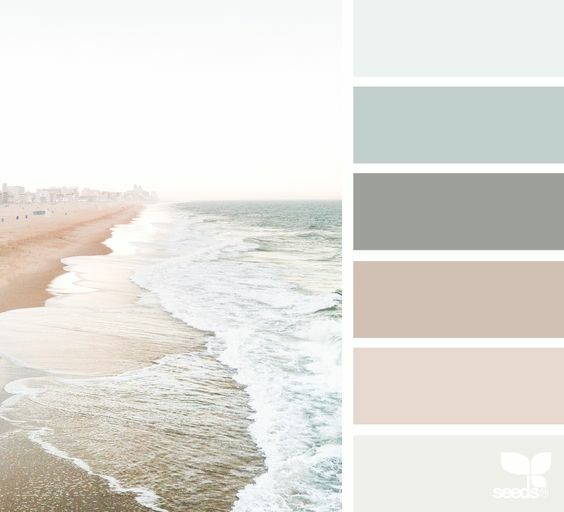 The first month, June, belonged to Esther from the Netherlands and her colour choices were backgrounds of white/light grey/cream and main colours of mustard, jadeite/minty blueish greens, coral. 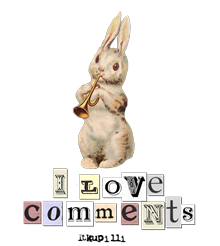 Many of the participants are habitual block swappers if their blogs are anything to go by. I am not – this is my first and I was only tempted because it is being organised by Kate who has just won first prize and a best in show rosette for her beautiful hexagon quilt called ‘Worldwide Friends’ made, in part, using fabric sent to her from her readers and adorned on the back with some Haiku poetry some of which was also contributed by some of her readers. I’m afraid, in the company of such talent, I have kept my blocks simple and concentrated on the colours and getting the finished size correct. I don’t want to disappoint too much with wonky edges and non-matching points – although I’m sure everybody will be very polite about things, it is forcing me to be much more careful and accurate than I would be if I was just making for myself. Which is a good thing, right? Esther has now received her blocks so I can show you what I sent her. A Daisy with a touch of French in the centre. They are not perfect by any means but I’ve kept well to her colour choices and hope she’ll be able to use them in the quilt or even for a coordinating cushion. 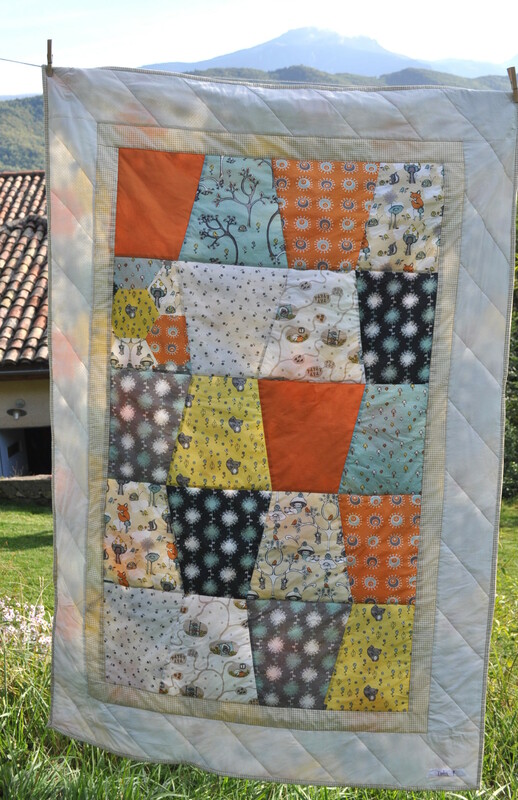 Next month is Annett’s turn from Germany and her colour scheme is a white background with orange, turquoise and green. Easy with the postage so far but there are participants from farther afield – Australia and the U.S. for instance but the three blocks fit in a nice small package and will go letter post so not too bad. Any suggestions for 12 inch blocks that are interesting but not too difficult (i.e. not too many points!!) would be welcome. 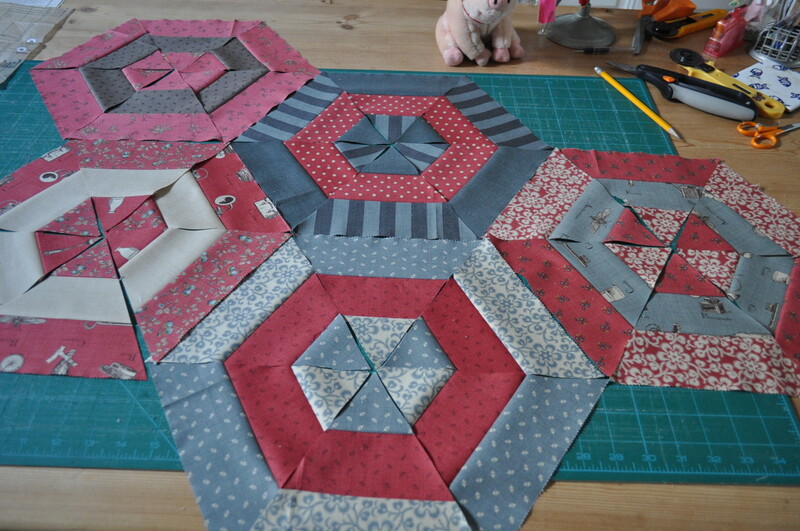 I have finished piecing the hexagons for the quilt I’m making for a friend. 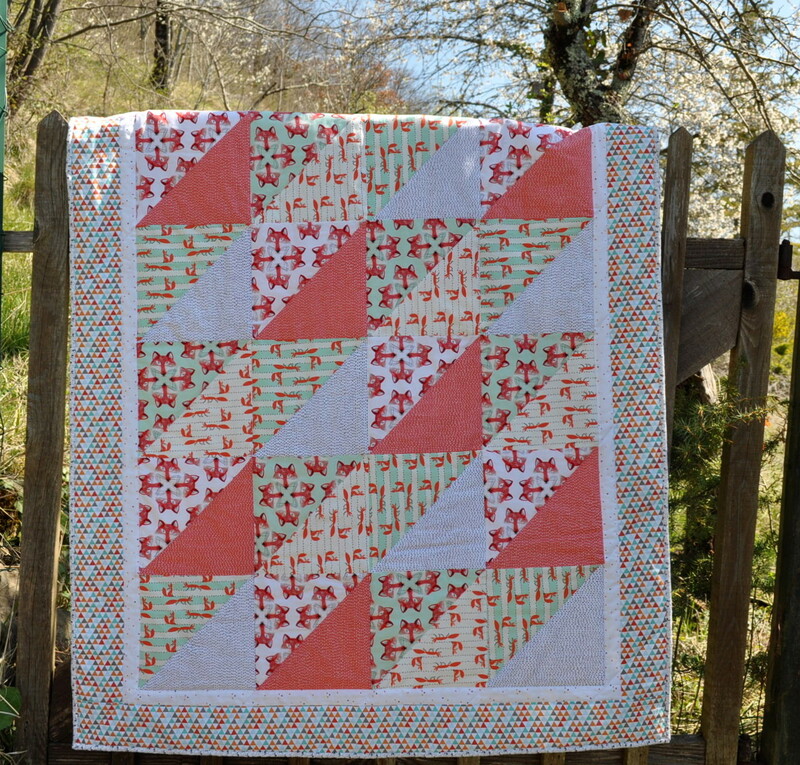 If you are from the Quilt Police, please do not contact me. I know there are one or two intersections that are not perfectly matched but, overall, I think my care with cutting and my 1/4 inch machine foot served me well. or something different altogether. What do you think? At the moment I am veering towards the cream as I think it lifts it and brings out the lighter colours – plus I have more of it – but I do like the mushroom also – help!! 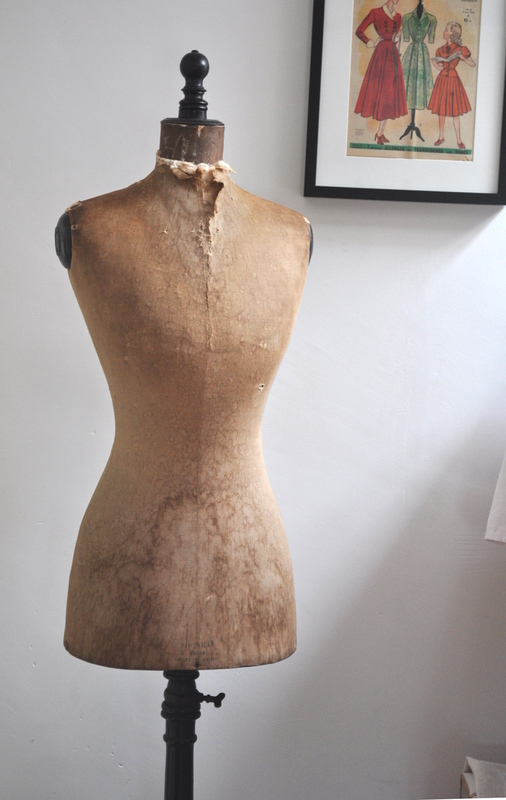 In other riveting news, I continued my tradition – well, I’ve done it once before – of finding a gorgeous vintage mannequin on the day of my birthday. Like Winnie the Pooh, she’s losing a little stuffing but she is of impeccable pedigree, being a Stockman with original stand and key and just look at that waist. I think it is very old as the size says ’42’ which would be a U.K. size 14 nowadays (U.S. size 10 I think). Perhaps a corset was expected – the bust looks a bit pushed together Nell Gwyn style. I am chuffed but, for some reason, Mr. Tialys is not amused. Off for a birthday meal in a couple of hours. We are going to have dinner in a beautiful and ancient old abbey where the view are gorgeous and so is the food. Salut! 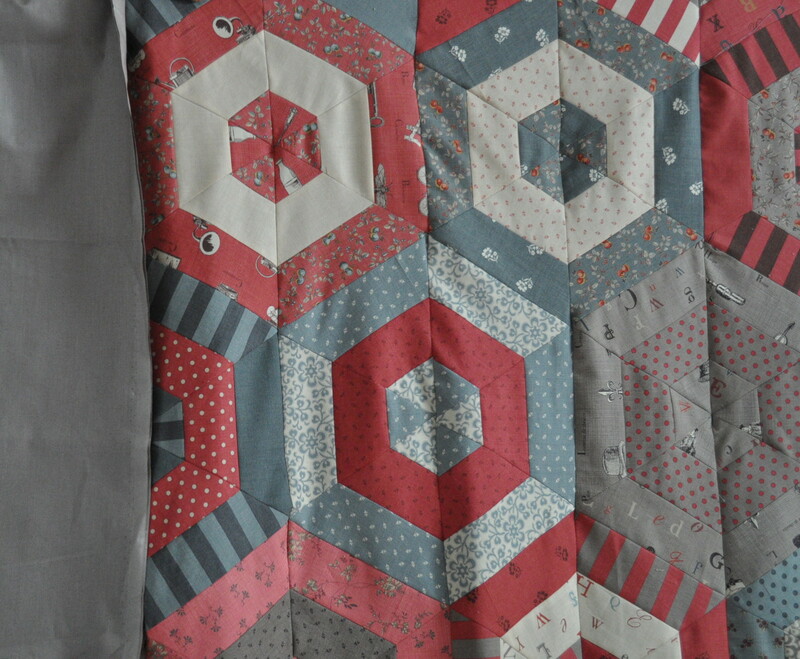 I’ve been a bit wrapped up in making clothes lately but now that I’ve started making a quilt I’ve remembered how much I love it – or at least the construction stage. 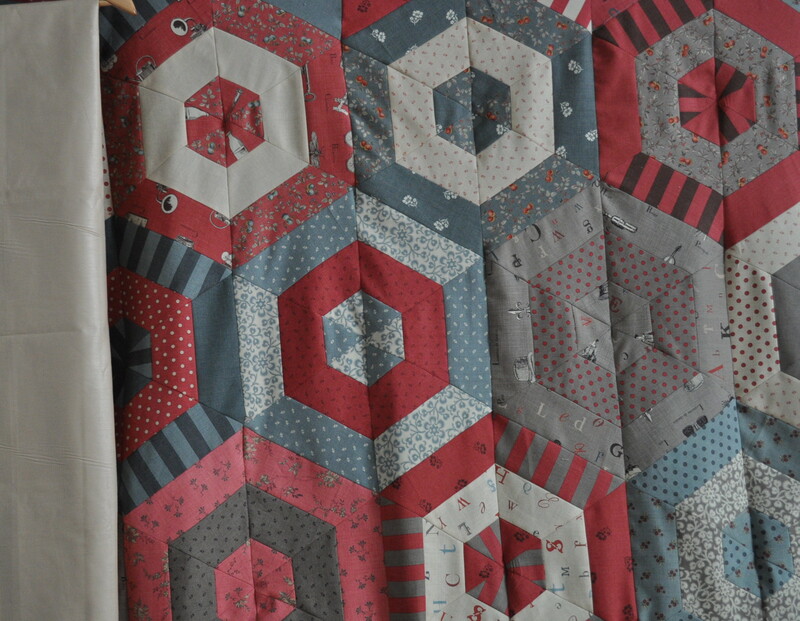 The swearing and the gnashing of teeth don’t usually start until the quilting stage. 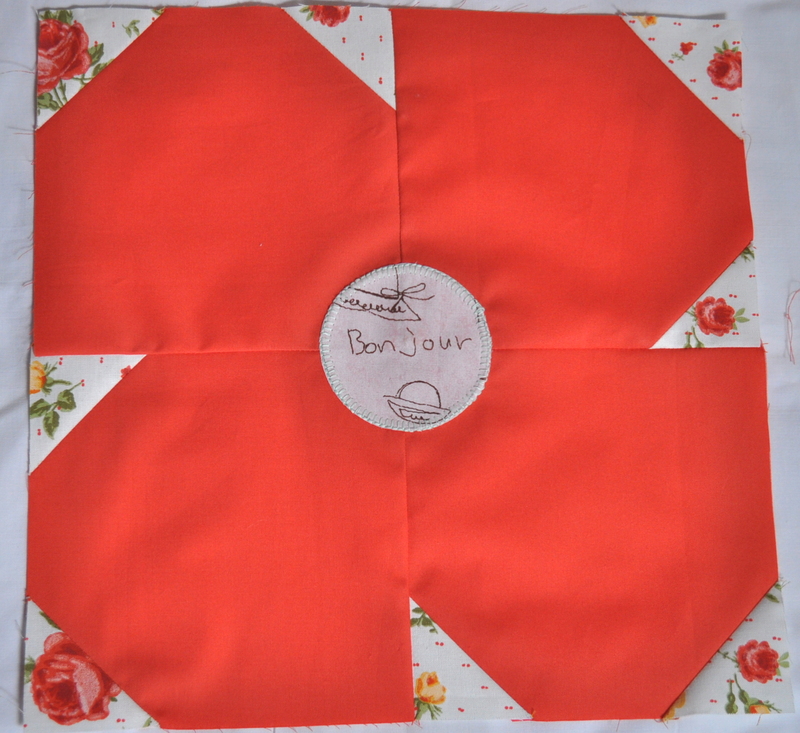 Remember I’d decided to use a Moda jelly roll in French General’s ‘La Petite Ecole’ design ? I just couldn’t wait to get those triangles cut but I didn’t have a 60 degree triangle ruler – the shop was shut (well, this is rural France) so I made a template. 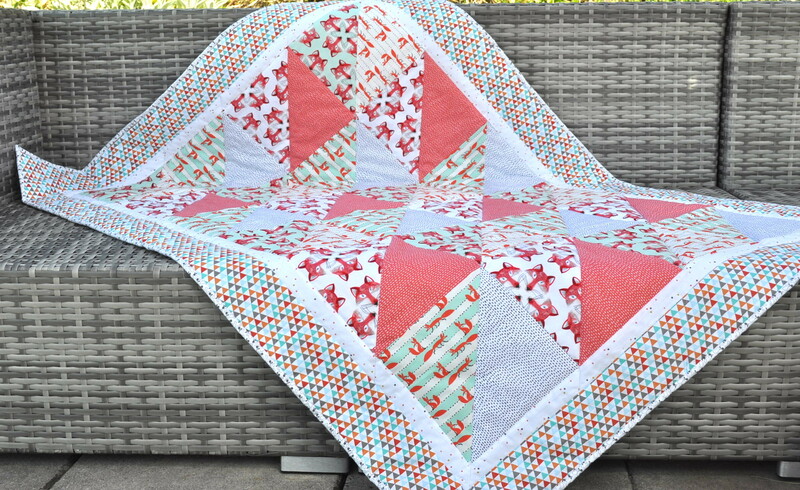 I made it wrong 😦 So, I had to throw away the first set of triangles I’d cut with it as they were on the wonk which meant three strips gone from the jelly roll. So, I made another triangle template and, this time, I concentrated. Plus, I had made it in strong template plastic so my rotary cutter went right up against it. I couldn’t resist arranging them into the hexagons they will become. Unfortunately, I’m not the greatest matcher upper of seams and points so this may be as accurate as it gets. Aah, patchwork, how I’ve missed you. I’ve decided I might not be cut out for these sew alongs/knit alongs/outfit alongs. I’m far too impatient. The sewing blog is talking about choosing fabric today and I just want to get on with it – I think the actual sewing bit isn’t even going to start for another couple of weeks. I like to find sew-alongs long after they’ve finished, when I’ve done a search for a pattern I’m having problems with and can find the help retrospectively, if you know what I mean. This ‘real time’ business might not work for me. Still, I won’t say too much as I’ll probably still be knitting the cardigan long after everyone else has finished. We will see. At least it has made me make the dress I’ve been meaning to make for over a year now. 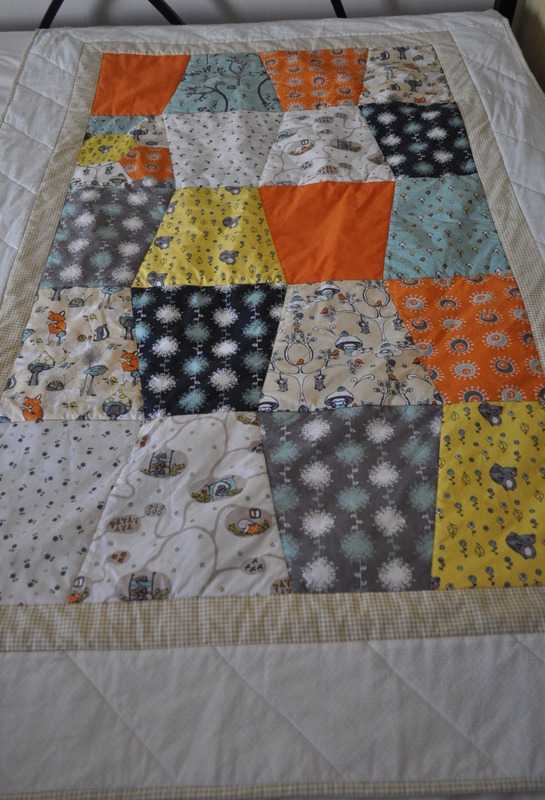 I love making patchwork quilts for babies. 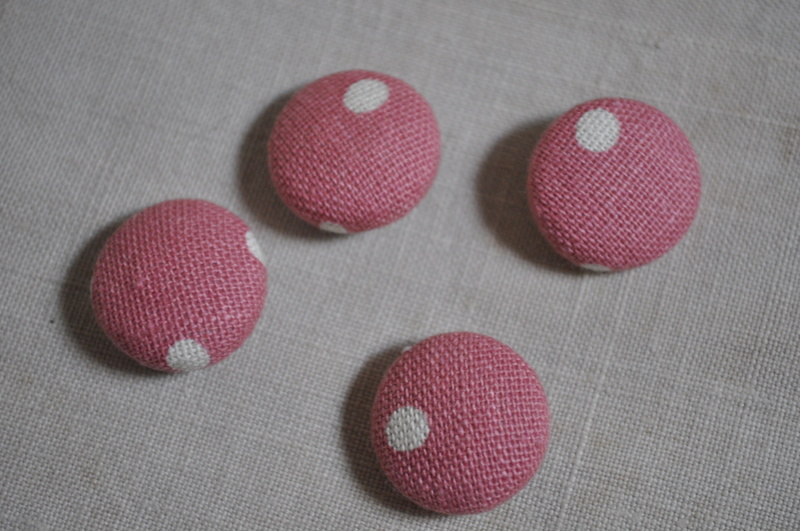 There are plenty of adorable fabrics to choose from, they make brilliant gifts (if you can bear to part with them) and, most of all, they are small. Hooray! I can actually fit one under my machine without feeling as if I’m trying to wrestle a huge, flat, soft opponent to the floor whilst coming over all hot and flushy. 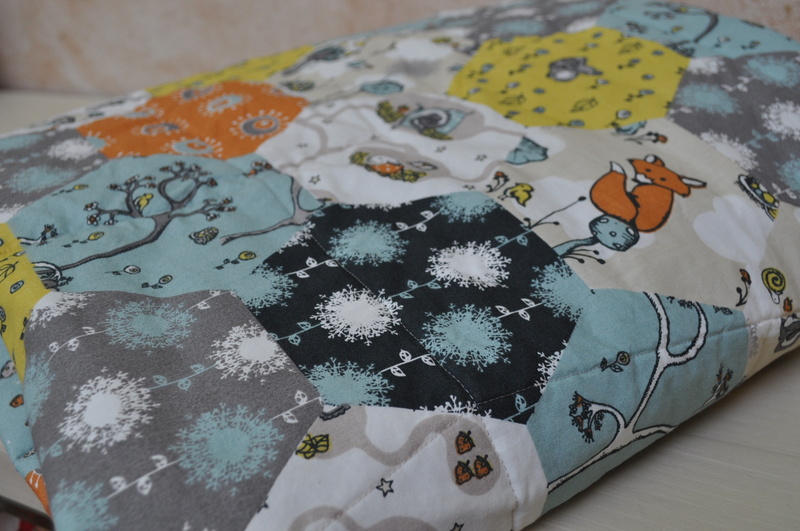 For some reason best known to my inner mental workings, I had already bought this lovely fabric called Scamper by Rebekah Ginda when I heard my god-daughter was expecting a baby. It is organic cotton and, as is often the case with me, the design turned out to be organic too as I basically made it up as I went along. I picked a sunny day so you can see the backing fabric showing through but you get the idea. 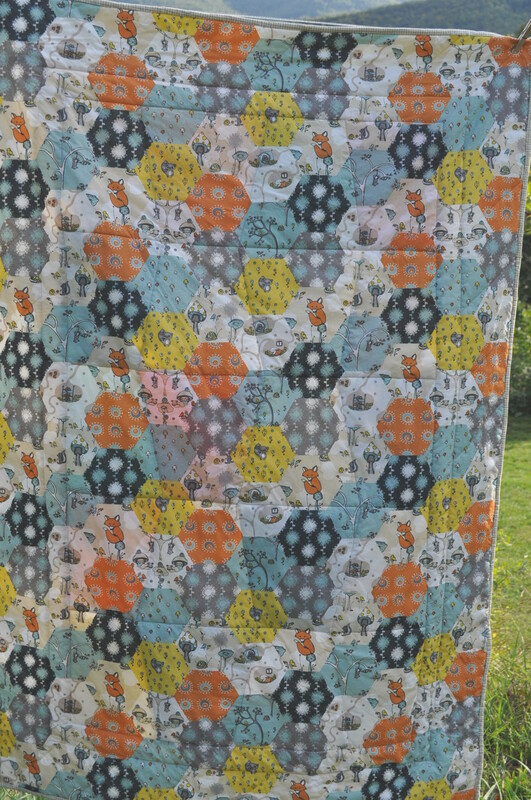 I wanted to do the Tumblers Quilt pattern from Pam and Nicky Lintott’s book , More Layer Cake, Jelly Roll and Charm Quilts but I downsized it to fit a crib and then ran into scaling problems due to my crap maths and it was difficult to match up those fabrics as they are in quite unusual shades. The orange, for instance, is not as bright as it appears in the photos but a more muted, amber colour. Evenutally I found the gingham fabric in the Tilda range and intended to use it for the whole border but then decided on a narrow one with a lighter, wider one on the outside to make the colours pop a bit more. 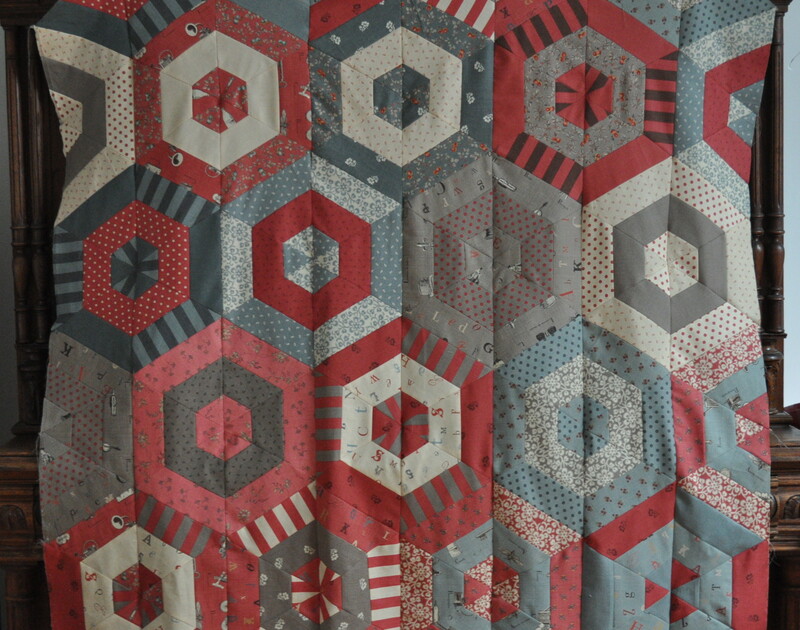 I love the cheater quilt fabric from the range which I used as backing and vaguely entertained the idea of quilting around each hexagon but then I got a grip of myself, sense prevailed and I did nothing of the sort. 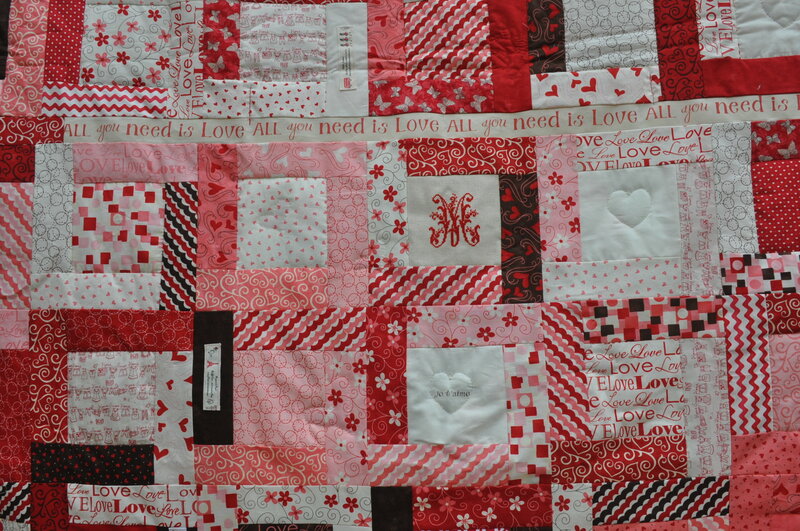 Instead, I quilted round the blocks at the front and just did diagonal lines on the wide border. Now I’ve heard my grand god-baby (made up relationship) is a girl in waiting so now I’m worried it’s a little too boyish. Girls don’t just have pink anymore do they? And, anyway, you can’t have enough foxes, mice, bunnies, racoons and other little creatures that hang upside down from their tails which I can’t quite identify, can you? Now, back to my next Lady Skater Dress. Only one year and 2 weeks late! 3) I sold a huge utensil holder/drainer to somebody in New Zealand and had underestimated the shipping. There followed a whole morning wasted whilst I tried – in vain – to use a lighter/smaller box to pack it in but, in the end, had to spend more money than I had received to ship it to the furthest corner of the Earth. Once I realised I wasn’t going to get it done in time I decided I might as well quilt it a little more heavily than I originally planned. 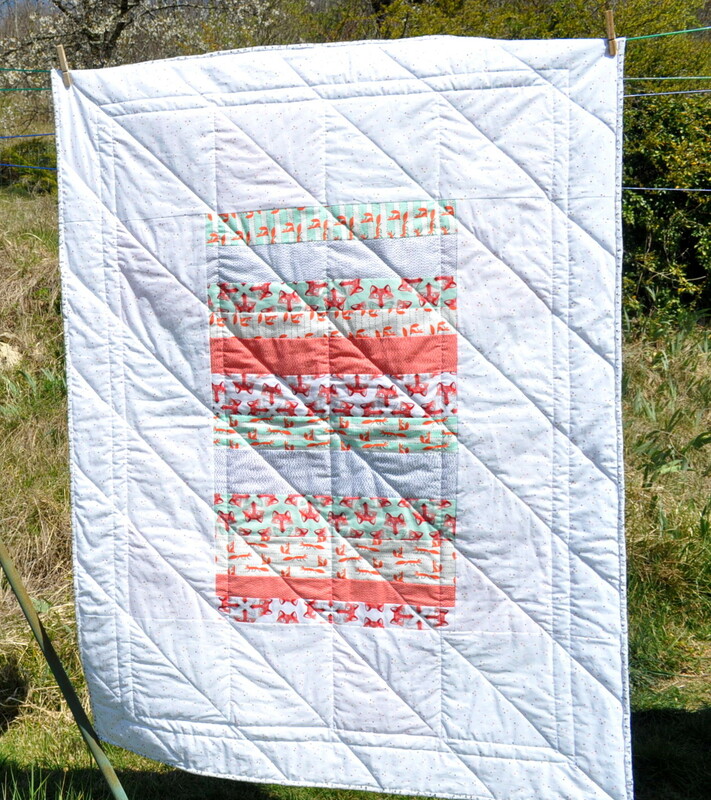 I use the word ‘quilt’ but, really, my efforts at quilting cannot be dignified with the term and I must describe it as‘ uneven running stitch through 3 layers‘. I think the problem may well be that I find it impossible to use a thimble either on my top hand or bottom hand and so I can’t ‘rock’ the needle in and out in the movement required to get tiny, or even, stitches. I must go on a workshop day or something. Once I’ve done the one for matching points that is. Anyway. 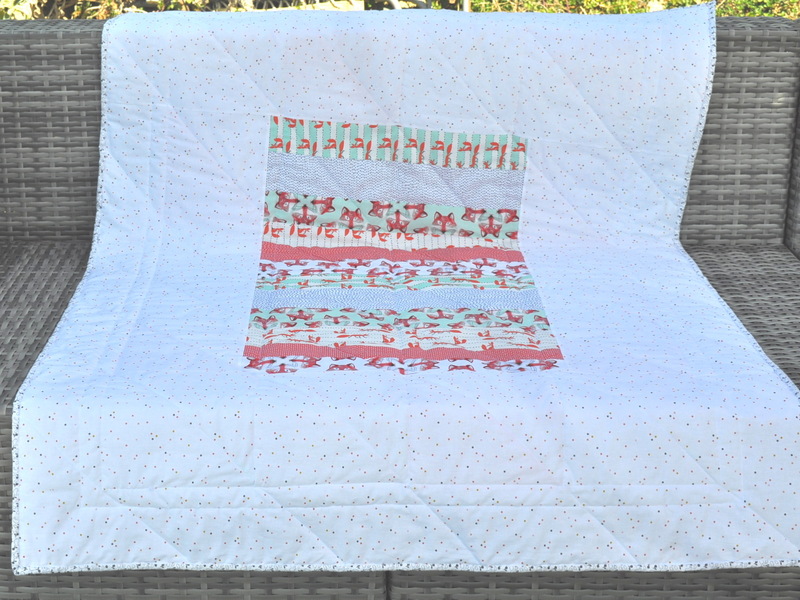 the other lengthy process with this quilt was the fact that I had made the back first and thus had to tie myself in knots working out the size of the top instead of making the top first, like normal people do, and fitting the (plain) back to it. 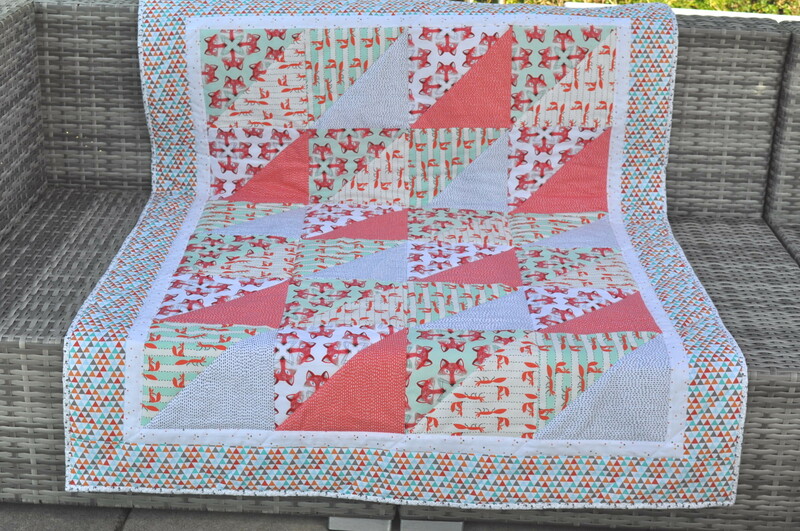 Ah well, you live and learn and Mlle Tialys the younger will be getting a much plainer quilt for her birthday in February. 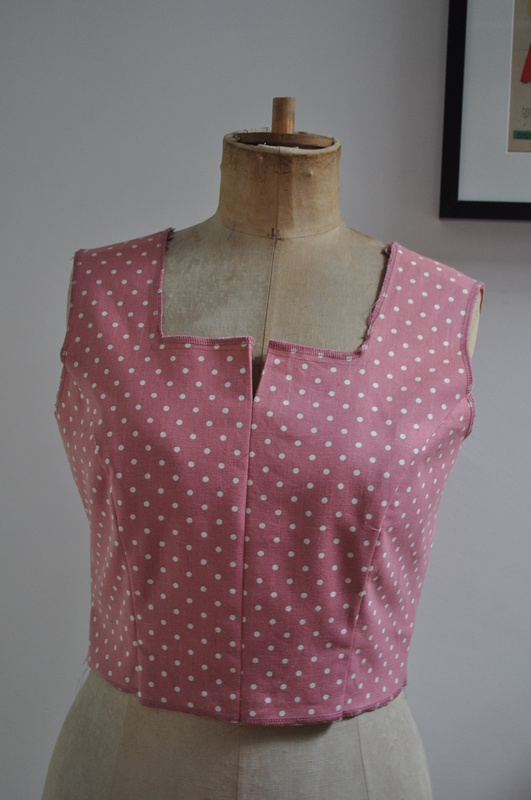 So, it isn’t perfect but heyho, it’s handmade and it is very ‘her’. Girly pink, hearts, chocolate, cupcakes and some Beatles’ lyrics – she might not always be into those things but right now she is so it will be a good memento of her late teens for her. The fabric is, apart from a couple of additions from my stash here and there, ‘L’Amour’ by Sandy Gervais for Moda which, of course, is now discontinued so, when I ran out halfway through, I had to trawl the depths of the internet searching for somebody, somewhere, with more supplies. 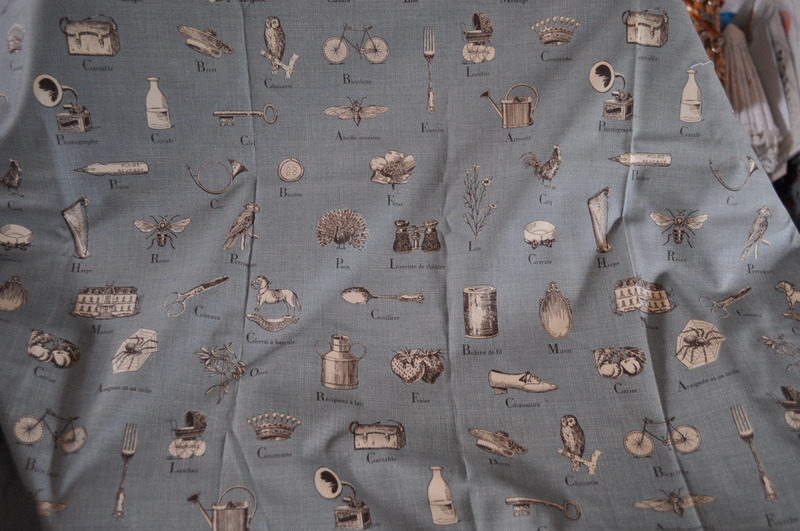 There is a beautiful monogram done in cross stitch by my friend Marie-Jo and some little tapes here and there with allusions to some of her favourite things like London, Paris, cupcakes, tea and home. 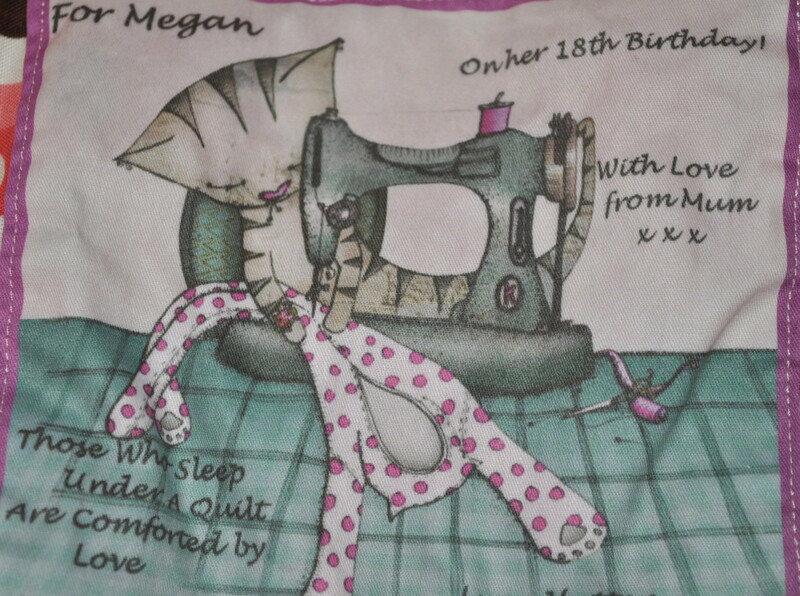 She is leaving for university the day after tomorrw and this will be going with her so I made her a special quilt label. I scanned in a lovely picture from a card I had bought and added some text. Then I printed it out on some special (and expensive) paper backed fabric which you can feed through the printer. First, I was thinking about transfers so I reversed the image and tried to iron it on – fool! – so that wasted a sheet of very expensive stuff but then I got it right and was pleased with the result as my embroidery skills are pants and she would be waiting another year for me to embroider all those words! I am on the verge of tears almost constantly at the moment. That’s me, a bad mother and I mean this in the sense of being somebody’s mother who is not good, not in the ‘street’ sense where ‘mother’ is followed by another word beginning with ‘f’. 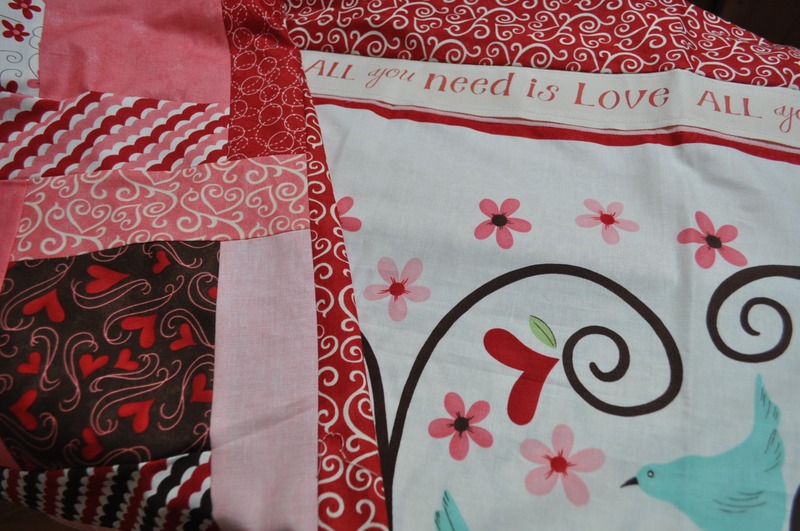 I can’t believe it is over a year ago that I posted about starting a quilt for my daughter’s 18th birthday but here’s the post, dated July 2010, so I can’t deny it . 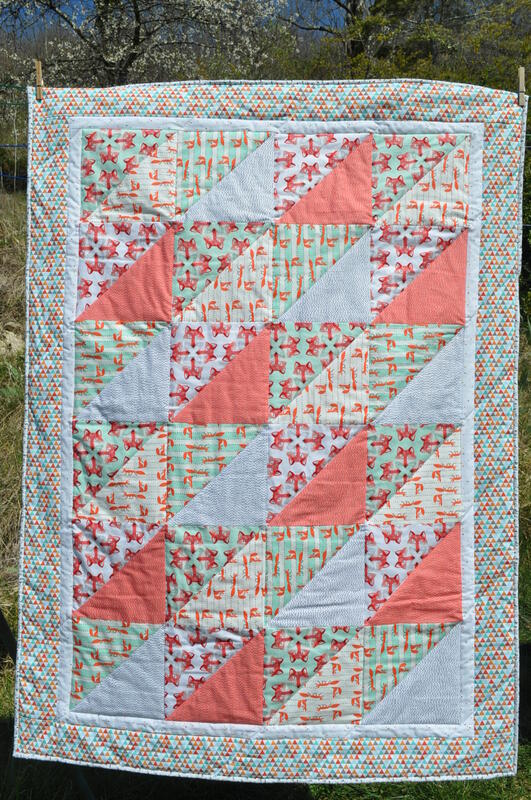 How we laughed when I said there was over a year to go so ‘no rush’ and how my daughter laughed yesterday on her birthday when she unwrapped the completed back of the quilt with an I.O.U. note for the rest of it. Here it is so far. I must really get on and finish it because my other daughter is 16 and a half and, at this rate, I need to start on one for her straight away.